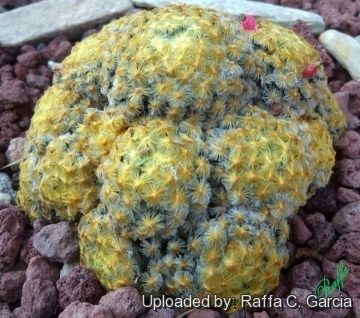 Accepted Scientific Name: Mammillaria schiedeana Ehrenb. Allg. Gartenzeitung (Otto & Dietrich) 6: 249. 1838 Otto & A.Dietr. Altitude: It occurs at elevations of 1,100 to 1,600 metres above sea level. 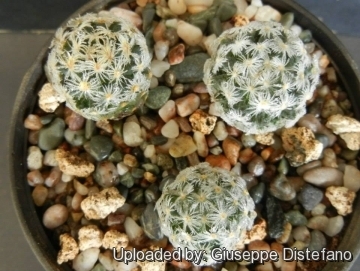 Habitat and Ecology: Mammillaria schiedeana is is rare across its range and is found growing on limestone and rocky slopes in submontane matorral together with Gymnocactus horripilus, Mammillaria geminispina, Astrophytum ornatum, Tillandsia alba, Bursera morelensis, Ferocactus glaucescens, Cephalocereus senilis, Stenocereus dumortieri, Stenocereus marginatus, Myrtillocactus geometrizans, Echinocactus platyacanthus, Opuntia bergeriana, Opuntia tomentosa, Opuntia atropes, Opuntia streptacantha, Opuntia imbricata, Opuntia pumila and Agave angustifolia. 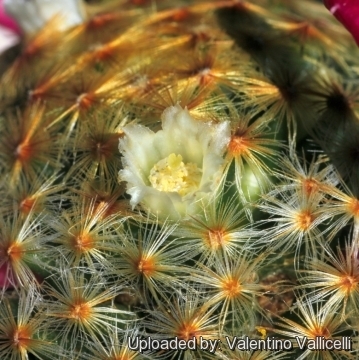 This species is threatened by illegal overcollection for trade for use as an ornamental. 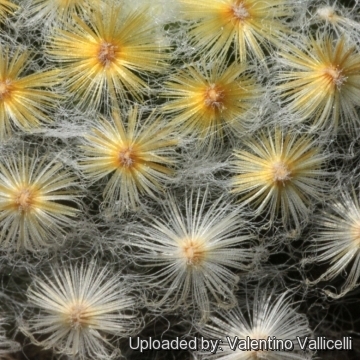 Description: Mammillaria schiedeana is a slow growing attractive cespitose cactus, with short, closely interwoven, hairy spines. It is somewhat soft in texture. Three subspecies are recognized, the nominate subspecies, subspecies dumetorum (J.A.Purpus) D.R.Hunt and subspecies giselae (Mart.-Aval. & Glass) Lüthy. 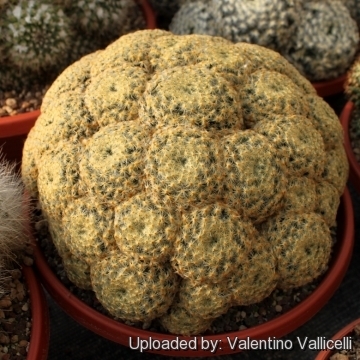 Stem: Globular flattened, more or less rounded at the top, dark green, soft-fleshed, 2,5-10 cm tall 4 to 6 cm. thick. Tubercles: Green, close together, terete, long and thin, tapering toward the tips, without latex, 6-10 mm long; axil with long bristle-like white or yellowish hairs protruding above the tubercles or absent. 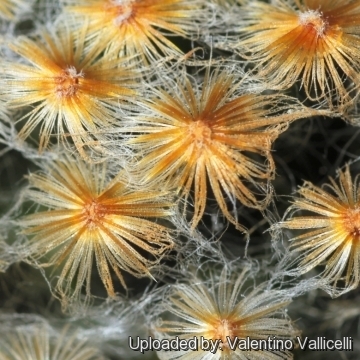 Spines of juvenile seedlings: Less than 20, all radials, pale yellowish-white, conspicuously plumose (feathery), gradually increasing in number as plant ages. 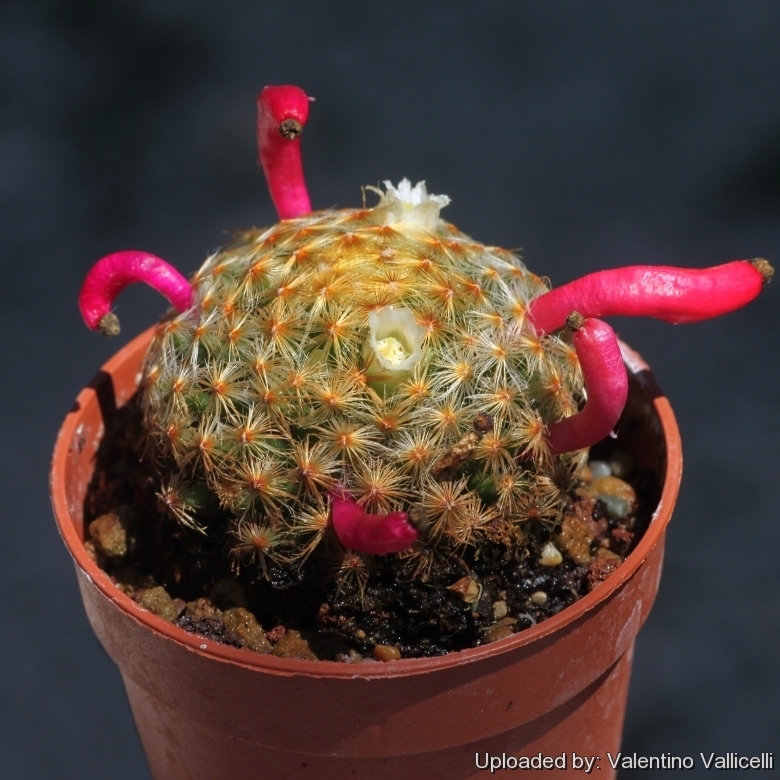 Radial spines: Very numerous (as many as 120) in several series, white to pale cream with yellowish bases, spreading, fine, bristle-like, puberulent, 2-5 mm long, tips hairlike. Central spines: 6-10, raylike and addpressed against the radials, a little stouter, feathery, yellow that turn white. Flowers: White to cream-coloured, 8-15 mm long; inner perianth segments white; filaments white, style cream-coloured; stigma lobes 4, short, obtuse. 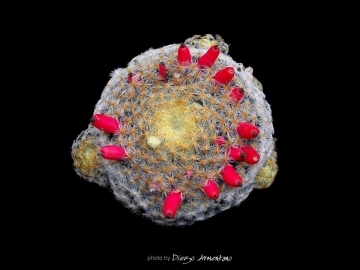 Blooming season: It produces ring after ring of flowers throughout most of the winter. Fruits: Red, narrow in late summer. 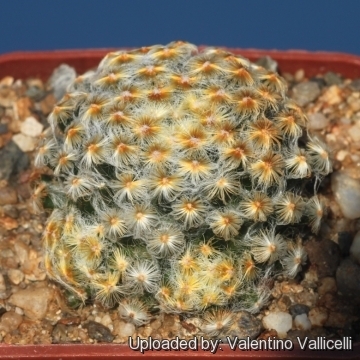 Cultivation and Propagation: Mammillaria schiedeana is a slow growing species of relatively easy culture, recommended for any collection. If grown correctly, it will reward the grower with generous displays flowers.